We're going to keep running the "Netflix Watch Now Movies Worth Watching" as a new weekly feature. It’s Friday, the economy (your countries economy as well as your own) is stinking it up and you’re looking for some inexpensive entertainment right? Well all you need is a one-out-at-a-time Netflix subscription and a Netflix Watch-Now Playback device or a compatible browser. Each Friday, I’ll be highlighting a selection of the newly added Netflix Watch Now titles you can check out – I’ll try to screen out the worst of the bunch and just leave the better quality ones or at least some of the “broader appeal” titles. Out of Africa Meryl Streep and Robert Redford. This one will appeal to the wife probably. Smart People - Sarah Jessica Parker and Dennis Quad. A "dark" comedy. The Shadow Riders - Western/Action-Adventure with Tom Selleck, Sam Elliot and Ben Johnson. Falcon Down - William Shatner :) Action Adventure flick that got okay ratings, but hey it's free. The Matrix Revolutions - Hopefully you don't need an introduction to this one. Certainly worth watching. I have it on DVD but if you don't check it out for free here. Stargate Continuum - Stargate fans should definitely check this one out. Full Metal Jacket - Mathew Modine is a Marine Recruit in this Drama directed by Stanley Kubrick. It's rough on the edges and not for everyone, but if you read the synopsis and are intrigued check it out. I have a large backlog of reviews and even some very nice giveaways that I've put off long enough. If you're interested in Home Theater PC's, extenders and HTPC keyboards stay tuned - next week is the week for you. The reviews are going to be worth your time and even better, I'll be giving away some of the goods to a lucky reader - including a brand spankin' new SageTV HD200! Keep your RSS feeder and e-mails focused on GeekTonic for more information! Let's face it. No HTPC solution has been more aggressive towards obtaining online content sources than Boxee has. The latest Mac version of Boxee just released today supports ABC with plans to release an AppleTV version within the next few days. The Boxee team also says ABC will not be available for Windows or Ubuntu versions for the moment. Boston Globe's "The Big Picture"
Good timing for Boxee with the new Lost season just starting last night. It's nice to have the online video sources as a backup for the rare moments when I miss recording a show with my HTPC. Boxee has popped the inevitable question on their blog this past week. Would you purchase a set-top box that had Boxee on it? 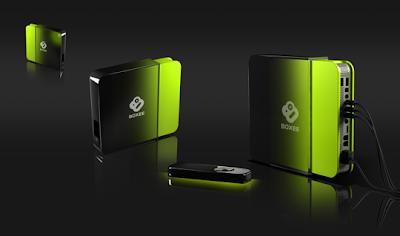 They say in the post that the team was approached by several manufacturers at CES about a "Boxee Box" and they're trying to gauge the interest. I'm not sure I'd pay $99 or $200 for it unless it could also do PVR functions or act as a HTPC extender. Still, I'm sure there are many who would like to see a Boxee Box or even an XBMC box with PVR functionality? When BeyondTV's latest version launched with BTV 4.9, one of the three, big new features highlighted by GeekTonic was the new capability to place-shift recorded shows over the internet. This place-shifting capability is now built-in to the web admin (gives BTV users access to electronic programing guide, settings and many other features across the web) page of BeyondTV. Something this feature also does is make it possible for Mac OS X users to watch recorded shows served up by a BeyondTV computer over the internet. The Snapstream Blog has a nice writeup on how this works and what is involved. It's a pretty easy process that requires BeyondTV on the home PC and VLC on the place-shifting computer (PC or Mac). You can fast forward, rewind and "seek" to a certain spot of the video with your mouse. Looks like it works with both BeyondTV as well as the Snapstream Enterprise product as well. Unless you have been living under a rock (in the U.S. at least) you probably at least knew the United States Presidential Inauguration for President Obama was taking place. Like many places all across the U.S. a good number of the workers in my office were attempting to watched the Inauguration ceremonies from one of the many streaming sites available on the web. What I noticed was many of those sites choked on the heavy usage and were either choppy or just plain crashed right during the speech. It was at this moment that my GeekTonic knowledge came in handy at the office as I was one of the few actually watching the broadcast in very good picture quality with zero playback problems. I did this with placeshifting - in particular SageTV Placeshifter on my laptop. Some day soon I need to do a full, SageTV Placeshifter review to go into more depth. I use it pretty often when I work late hours at the office. Access to all of my recorded shows, liveTV, movies and music - all with the same, familiar interface is a really nice feature when you're at your "home away from home" whether that's your work, a hotel or where-ever. 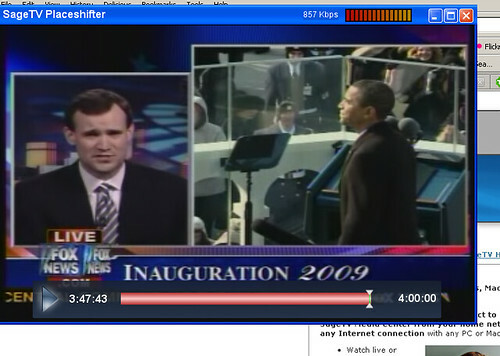 And for those times when you want to catch something on TV and you're not at home, placeshifting is a great way to do it - yesterdays Inauguration is a great example of that. Elgato released the new version of EyeTV this week with EyeTV 3.1. EyeTV is a HTPC software program for Mac computers. The new version includes a new TV Guide EPG, Parental Controls Support and official Hauppauge HD-PVR support. New TV Guide EPG - TV Guide will be the new Electronic Programming Guide (EPG) for EyeTV and open up the program to some new features. Former users who wish to stay with the older TitanTV EPG can do so for now although support for TitanTV will end eventually. The new EPG service will be included (read free) for the first year after which it will cost $19.95 per year. Smart Series Guides - This new feature works with the new electronic programming guide to allow users to record all of the episodes of one series. EPG Search by Genre - Just as it says, you can now search the EPG by genre with EyeTV as long as you use the new EPG service. Parental Controls - Block Certain content as desired for the kids. Hauppauge HD-PVR Support - Beta support for the HD-PVR started in November and EyeTV now has official support for the Hauppauge HD-PVR. this means you can watch live and record TV from all channels via your Cable Box or Satellite Box! Bug Fixes - lots of other bug fixes in the release. EyeTV 3.1 is a free upgrade for EyeTV 3 users as well as EyeTV 2 users who purchased the older version on or after December 1, 2007. Other EyeTV 2 users can get the upgrade for $39.95. Those new to EyeTV can purchase a new license of EyeTV 3 for $79.95. If there are any GeekTonic readers out there using EyeTV, let me know in the comments. I have long been both an audiophile and a technophile, but until about a month ago I never owned an iPod. How is this possible? Well, contrary to popular opinion (or outright ignorance) Apple did not invent the mp3 player. The ipod is not the first player, and quite honestly it is not the best. It is however the most commercially successful, most prevalent, and in many cases the only mp3 player compatible with many other really cook gadgets. Jump to present time and we have three major players: Apple, Sandisk and Creative (And Zune except on leap years). Apple is the clear leader from market share but not because it is the best. 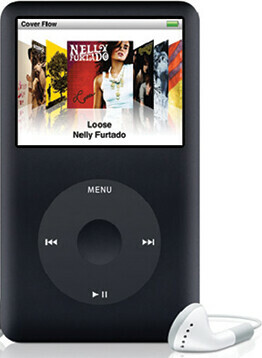 iPods have been plagued with issues, from easily scratched displays to exploding batteries. There are several deal breakers that kept me from considering iPods, let alone that they were made by Apple who I have philosophical issues with (but more of that later). Things like not having a replaceable battery, no external memory slot, DRM, proprietary formats, and letting iTunes take control of my music. By contrast, Apple’s biggest competitor is Sandisk, who has the advantage of being a flash manufacturer (and also doesn’t feel the need to pay for licensing the mp3 codec, but that’s another story). I personally use them as my preferred flash based player, although I admit I do have a few Creatives (running distant third) as well. Both have models with expandable memory cards (SD or microSD), models with replaceable batteries, and allow direct file manipulation rather than being locked into a control hungry program. Now, for all my iPod bashing, I will admit that it does have one of the better interfaces (although I personally like the Sansa scrollwheel better than the iPod). When properly loaded it is faster to navigate and does offer features like lyrics and smart playlists that I think are superior, especially on the latest generation. Format conversion is much easier these days and there is a definite trend to go DRM free. I still stick to mp3 format and use the ID3 tags extensively. Ok, that’s enough babble about history and philosophy, now the important question. I break down and buy a new 120GB Ipod Classic to replace my aging Creative Zen Xtra and despite philosophical issues with how Apple does business (buy everything through us!) I feel no remorse for buying this particular iPod. I got it with a Windows Live Search rebate that paid me $75 to buy it (and I really love the fact that Microsoft had to pay me to buy an Apple). But now that I own an iPod, the question is how can I use it without allowing the control freak spyware and crapware loaded iTunes on my computer? 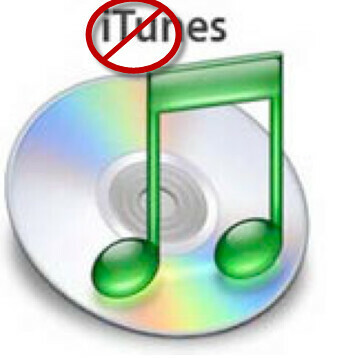 ITunes is designed to sell you Apple’s products, while it offers some features that allow you to manipulate your existing collection it limits your flexibility and dictates its terms. The default settings control synchronization and set them up automatically so unless you adjust your settings just right it kicks things off the minute you plug in your iPod. It installs software without asking, changes things without permission, I gave it 5 minutes on a test machine and it was gone. So, my stated goal, find an application or set of applications to synchronize music, video, photos, calendar, contacts, and make sure it recognizes all id3 data correctly. There are several programs and plugins that will work as partial replacements for itunes, almost all of these require Disk Mode, and all but one cannot change the ipod into disk mode without itunes. However, there are hidden functions in the ipod that can change it to Disk Mode without iTunes, http://www.command-tab.com/2006/03/30/hidden-ipod-commands/ For mine I need to hold down select and play. The open source product I liked was Songbird . This also was multiplatform, is open source, and allows direct control of the ipod. The drawback I had with this is that it didn’t recognize my id3 tagging of my music collection (which I put great effort into) and I was not about to manually retag all my files for Songbird, so back to the drawing board. There are other products, MediaMonkey, Foobar2000, Yamipod, and some linux only products like Amarok and Banshee. There is also a pay to use Windows Media Player plugin called Mgtek which I did not try because there were too many free alternatives. In the end I settled with Winamp, as this was the most versatile in my opinion for windows, and though its not open source, it is freeware and has a lot of custom plugins. It does not do anything with contacts or calendar, but for that I wanted to use Thunderbird. If you’re not using Thunderbird for email and address book (and you should), then this does not apply. First off you need to install the lightning plugin if you want to use calendar. (I use an icalendar file so I can sync with my PDA using Finchsync, but that’s another story) Then you need to download the MozPod plugin. It's about a year and a half old (April 07) but otherwise works. You can set it to clear contacts before synchronizing (default) and it pretty much wipes out old data when synching new data, so you probably want to check to make sure it is done before closing Thunderbird. As a precaution I leave it disabled and turn it on when I want to update my ipod. Support for Lightning calendar is supposedly preliminary, but it does copy all my appointments, holidays, etc. and it did remind me of a friend’s birthday when the alarm popped up. The main workhorse application is Winamp and to fully interface this with the Ipod you need the ML ipod plugin. This adds a lot of features above the integrated iPod support, specifically better album art, smart playlists, lyrics, and photo synchronization, which I will get into a little later. 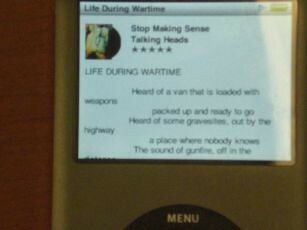 Now one thing I didn't know about the iPod classic is that it supports id3 stored lyrics, although it can be quirky about which ones it shows (different programs store lyrics differently, so not all lyrics that are stored will show up). Most people probably could care less about lyrics, and I'm not a big Karaoke fan but every once in a while I get that “what the hell did he just say” moment and like to go and look it up. That, and it adds another screen to display while playing. I have used a program called Zortam in the past to download and store lyrics in my id3 files, however lately their search engine seems useless so now I just manually add them. I know you can add lyrics in Musicmatch, but these are not recognized by Windows Media Player, and probably not by the Ipod. This plugin works pretty well in Winamp - Joseph DkE Lyrics and from what I can tell if you edit lyrics there they appear in the iPod. Setup for iPod support is fairly simple. 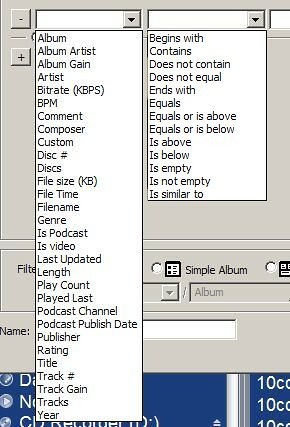 While the default settings are fine for music, you will need to setup specific folders and photo settings under options-preferences-iPod support. Under Audio and Video, the Folders tab lets you state where different types of videos are stored on your computer (Movies, TV Shows, etc). 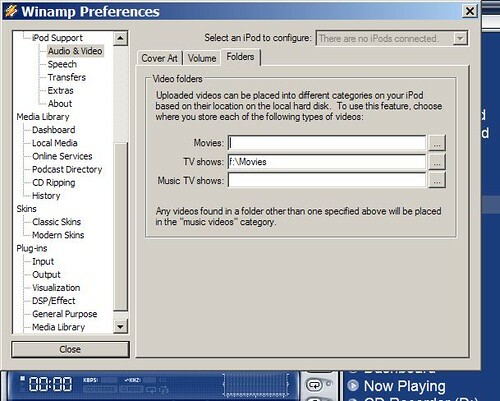 You will need to convert your video files to iPod mp4 format (I use Snapstream BeyondTV which has this feature added). Photos are taken care of under Extras-Photo Upload. I set up Winamp with my pc music library, and manually update the library whenever I add music. There are many ways to tweak and automate this, but I’ll leave that to the Winamp forums. Then I plugged in my ipod for the first time and Winamp instantly recognized it. I was able to upload my entire music database using the sync button and a little patience (about 80 gb worth). If you want to sync video with the ipod, you need to add those files to the database as well (selecting Add Media To Library automatically puts them in the Video tab). Once you have your files on the ipod, then comes the tedious part (assuming this is your first ipod), fixing your id3 files. The bulk of my collection was fine, but since every organizer stores data in the id3 differently (and there are 2 versions) not every song or album is correct. Winamp is somewhat case sensitive, meaning the album names “Let It Roll” and “Let it Roll” will appear differently but be in the same album. The ipod is anally case sensitive, so not only will these be different albums, but every time you switch from “It” and “it” and back again in a song it shows up as a new album. I’ve seen some albums split up to nine times because of this. Sadly, the only way to fix this is to scroll through the music library on the ipod itself, make notes of multiple artists (like AC DC and AC-DC) and albums, and then edit in winamp and resynchronize. In addition to the music library, and the embedded views of artist, album, and Genre, both Winamp and the iPod let you make playlists, and in particular Smart Playlists (or Smart Views in the Winamp music library). These playlists will use operators to select the songs in the playlist, usually from ID3 data but you can also include info such as Played Last or Track Gain. There are two ways to make Smart Playlists. 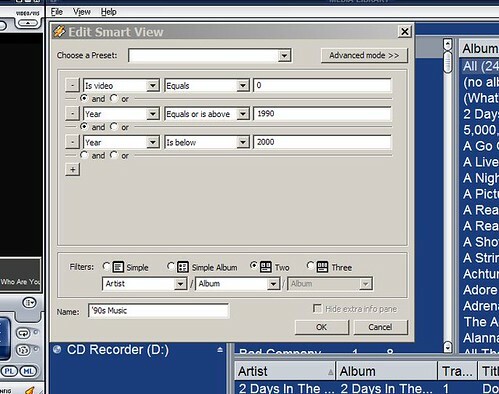 They can be generated on the iPod itself in Winamp, or you can make and generate a Smart View in your music library and synchronize it. I generate sets based on the year of the song (Year=1990) and decade (Year>1989 and <2000) or specific keywords I place in the comments tag (Comments contains “mellow”). You can put multiple words in the comments tag and use “contains” in the smart tag so that the song shows up in multiple smart playlists. Now even if I switch to other programs or add songs, I can use the id3 settings to organize playlists the way I want. Another feature is the ratings, which you can apply on the fly in the ipod. Setting a playlist to read ratings (ratings=*****) will automatically add that song to that smart playlist, and when you synchronize your iPod, ratings can be synchronized as well. 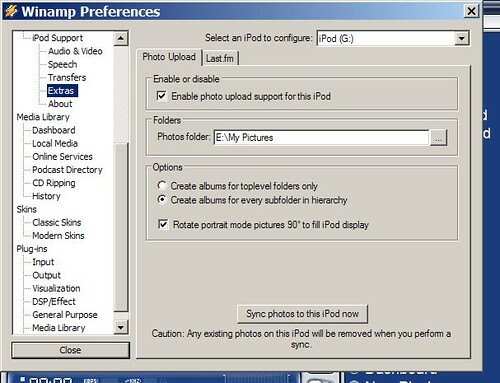 Lastly, the ml_pod plugin lets you synchronize pictures between your computer and iPod. Now this feature still needs some work, and is in some ways better and some ways worse than iTunes. ITunes lets you choose a photo directory, and all folders in that directory become folders on the iPod. All subfolders however get added into those folders. If you want to exclude some pictures you need to keep them out of that directory. I believe it does however let you update some pictures without making you load the entire database again. Ml_pod handles folders more intelligently. It lets you choose if subfolders get merged into folders or if they are separate. Also you can add flags, make a file in folders called "skip.flag" to skip that folder and subfolder, or if you want to include a subfolder of a skipped folder put a file called "include.flag" in it. It also lets you rotate portrait pictures to maximize size. The one negative is that it writes the database every time you sync, meaning large collections take a really long time as it converts each picture for the ipod. As a result, I probably will update pictures once a quarter. Itunes will also let you sync with photoshop elements if you tag pictures there, which ml_pod does not do. Finally there is support for podcasts, audio books, LastFM, a lot of features I currently don’t mess around with now but will play with, specifically as the plugin is developed. There are other tweaks such as reorganizing playlist order, gamma corrections for photos, or transcoding incompatible music files. Best is to read the wiki at http://mlipod.sourceforge.net/wiki/Main_Page . There are still a few limitations, you have to buy your music separately (obviously) and there is no support for game downloads etc. For those you will still need iTunes, at least for now. Of course you have the option of replacing the iPod firmware with the likes of ipodlinux or Rockbox, but that also takes away the compatibility with cool devices like my Yamaha dock. The choice of games for non-touch iPods is rather limited so no big deal for now. Anyway, hopefully this helps others in a similar boat as me. I am not trying to make a plug for the ipod, while it is pretty cool once you properly de-Apple it, I am hoping the competition (Sandisk, Creative, etc) make more inroads and can force a universal compatibility in docking devices. Many thanks to ZetaVu for sharing his experience with MP3 Players. This was the second, hopefully of many guest posts on GeekTonic. 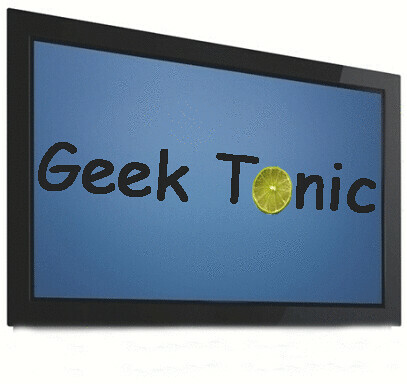 ZetaVu is a frequent commenter at GeekTonic with a great deal of knowledge with HTPC's and other media gadgets. I've gotten to know him from the many hours spent on the Snapstream, MediaPortal , AVS and other Forums where you'll often find him (under the same online name). SageTV is inching closer to releasing 6.5 out of beta. 6.5.7 was released Friday to add in a few bug fixes, the most significant being reverting to the 6.4 version of the demux to resolve some stability issues. Convert BBC HD ac3 aduio into a private stream id (0xbd) tagged PES stream. Updated support for paged Google Video searches. Week 3 of the Winter 2009 TV Season is upon us. I'm really looking forward to Lost as well as the return of Fringe, House and Burn Notice. Read on for all of the details. Note: Download a free, PDF of all premieres and returning TV shows. Download includes two sections - one sorted by release date and another sorted by title. This has been updated with many additions and corrections from the last version - only those shows from 1/18 and later are included in this version. Big Love (9pm Sunday on HBO - Available in HD) - Season 3 premiere about a polygamist and his troubles. Flight of the Conchords (10pm Sunday on HBO) - Season 2 premiere. This series is a fictionalized look at the lives of a New Zealand duo staring in a folk/comedy-band named "Flight of the Conchords". The United States of Tara (10pm Sunday on Showtime) - Series premiere. This is a new comedy on Showtime about Tara who suffers from dissociative identity order. Lost (9pm Wednesday on ABC - Available in HD) Lost returns for season 5 premiere. Looks like the folks that were "lost" are heading back to the island. Should we change the name of the show to "Found" now though? Should be interesting. Lie to Me (9pm Wednesday on FOX – Available in HD) a new series on Fox. This new crime drama series follows "the worlds leading deception expert" who studies facial expressions and involuntary body language to determine when and why a person is lying. His skills are used by law enforcement and government agencies to get to the truth. RelicQuest (10pm Wednesday on Sci-Fi – Available in HD) Series Premiere of a Sci-Fi series listed as a "reality/news documentary" whatever that means. In this series, we travel the world searching for objects believed to possess mystical powers. Masterpiece Classic: Wuthering Heights (9pm on PBS) - PBS has a two-night special with Wuthering Heights. Powerpuff Girls (8pm on Cartoon) The Cartoon network is airing a special half-hour showing of Powerpuff Girls to mark 10 years on Cartoon Network. And they have a all-day marathon of this show leading up to the special. House (8pm on FOX – Available in HD) Dr. House returns on Fox at a new time. 24 (9pm on Fox– Available in HD) - not a premiere, but a new time for 24 Monday. Inaguration Day - Those of you in the U.S. (and probably everywhere else for that matter) may have heard about this little event going on in Washington D.C. this week. Lots of coverage across the news outlets, HBO, BET and TV One to name a few. Pretty much just expect coverage all over the place on Tuesday. Lost (9pm on ABC - Available in HD) Lost returns for a 2 hour, season 5 premiere. I've read several reviews of this premiere and based on all of those I'm expecting this episode to be one of the best yet. Don't miss this one if you are or ever have been a fan of Lost. Lie to Me (9pm on FOX – Available in HD) a new series on Fox. This new crime drama series follows "the worlds leading deception expert" who studies facial expressions and involuntary body language to determine when and why a person is lying. His skills are used by law enforcement and government agencies to get to the truth. RelicQuest (10pm on Sci-Fi – Available in HD) Series Premiere of a Sci-Fi series listed as a "reality/news documentary" whatever that means. In this series, we travel the world searching for objects believed to possess mystical powers. Bones (8pm on FOX – Available in HD) Bones moves to a new time on Fox. Burn Notice (10pm on USA – Available in HD) We haven't seen Burn Notice on USA since September, but don't let that fool you into thinking this is a new season. No, USA calls this a continuation of season 2 after a long, Fall break from new episodes. That’s it for this week. Stay tuned for many more premieres including Chuck, the Closer, Heroes and more which you’ll find on GeekTonic this coming Sunday morning and each week on Sundays.